The problem with trying to curb the spending is that you become very aware of how bombarded you are by listings for secondhand sundries or new listings for custom dolls. Suddenly all of the new stock releases look very appealing, and one of those fantastic dress seamstresses that I love? I had to talk myself out of hitting checkout with the Etsy cart despite reaching the listing within possibly ten seconds of it being listed. On the bright side, my No Spend challenge is only for the month of January. After that, I will have a (small) budget set aside for fun dolly spending, which s always nice! But being aware of how easy it is to be sucked into the buy, buy, buy mode is rather alarming (and thought provoking as well). I shouldn’t be too surprised, because a lot of how we interact on the internet when it comes to Blythe. Maybe if we stare her down, she’ll buy us some new dresses! Cameo wears Plastic Fashion. Halo wears a dress by an unknown seamstress. If you go to forums, there are always some Buy/Sell/Trade threads up. If you log onto Facebook and you’re a member of one of the dozens (hundreds?) 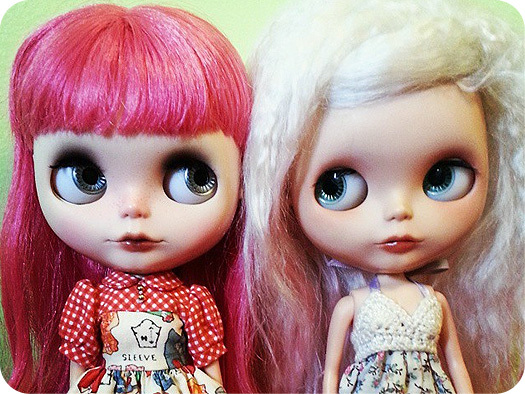 of Blythe-related groups, you’re probably also in a group that involves buying or selling dolls and sundries. I’m still not sure how I wound up in them, I suspect sabotage by friends who thought it’d be a good idea to invite me into those groups… Regardless of where you go when you’re looking at doll things, it is difficult to not be confronted with listings and ads for new dolls, clothes, shoes, and even furniture! Fortunately (or unfortunately…?) with my schedule now, I haven’t been able to spend a lot of time online, which means that I’ve been missing a lot of listings for dolls, clothes, and shoes for sale. Two weeks into January and I’m still doing very well for my No Spend month! No new dolls, doll clothes, or doll shoes (sobs!) in the mail for me. I did have to buy a present (somewhat unexpectedly), but that was sort of necessary and not-doll related. Hi I just found your site! I am waiting for my first doll to arrive. Can you tell me how you joined the forums? When I have tried it said I needed the name of a member (Blythe Kingdom) but I don’t know anyone else into Blythes! Hi there! You can also join/register if you have an active Flickr, Etsy/Artfire, etc. account on social media.